LMAO! Let's just imagine this stupid bill get the 2/3 approval of both the House and Senate. If Trump wins the popular vote in 2020, the Democrats would immediately want to bring back the electoral college. The Left has long wanted to push everything to a direct democratic vote. They also push for lowering voting ages. In Europe the Left has proposed in the past giving everyone from cradle to grave the vote. If the electoral college were dissolved and Presidents elected by direct popular vote, then only 7 states would matter. That's because they make up more than 50% of the population. The Left knows that, and they recognize that the majority of those states are also Progressive strongholds. Now, if you want to see the Left go into hysteric apoplexy, tell them you want to eliminate "winner take all" in state elections and apportion electors to the college by voting percentages or by district instead of by the state's overall popular vote. The Left would never win a Presidential election again if that happened. The U.S. is not a Democracy, it is a representative republic, only the destruction of the education system by the Democratic leftist teachers unions prevents this from being common knowledge. 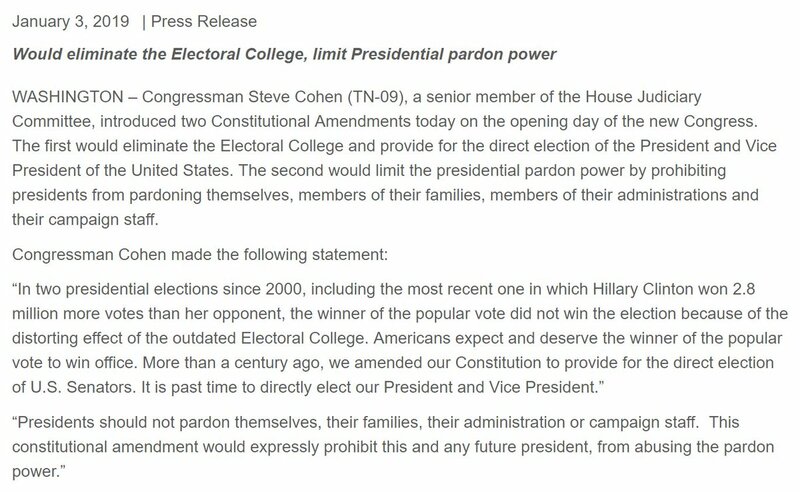 I would completely support elections by apportioned electors to various colleges by districts instead of by overall popular vote. My question is how would those districts be set up? I can already hear the zombie chants of racist, sexist, homophobe, Islamophobe, and Nazi. It would be fun to try and do this and listen to the idiots like Cortez squeal. The shut down is nothing like the pain government workers are going to feel when the pension funds in all the Democratic strong hold cities and states go belly up in a few years as they already have in places like San Bernardino, Stockton, and Vallejo. That most people are blissfully unaware of these Democratic failures and pending failures means the media is corrupt to it's core. It is rapidly becoming the number one national crisis. Everyone should have the right to vote except racists, fascists or brain damaged. Since the only people who'd vote Republican are racists, fascists or brain damaged (or all three), just assume the Dems will by acclamation, then Clinton, Pelosi & Schemer can appoint the new overlords. Last edited by Freebird; 13 Jan 19, 02:23. I'm sure the Democrats have a plan for preventing any interference with a new type of election...so long as they win it. I personally do not like the Electoral College due to the reasons why it was created, but I do not believe the Democrats have a plan to replace it with something ethical, honest and representative of the will of the American people. Toss out few more insults while yo;re at it, why don't you? No reason to hide your hatred and ignorance of other people any longer. Tell us what you really think. Not number one...just one of many. OK, you did get that my post was complete sarcasm right? The answer for pretty much everything from the left these days is racism! Nothing to do with the fact that most people in most states viewed her as corrupt and/or dishonest. So 30+ states voted for the old white guy instead of the old white lady because of? Racism. Think right wing views should be allowed on campuses? Racism!